Statistics reveal over-dependence on pace spearhead Zaheer Khan is hurting MS Dhoni’s team. Former India pacer Manoj Prabhakar agrees. Though there are numerous reasons for India’s whitewash in the four-match Test series against England recently, the over-dependence on pace spearhead Zaheer Khan – forced to miss three Tests due to injury – tops the list. Zak looked all set to conquer the English batsmen in their own den after getting a brilliant start in the first Test at Lord’s where he dismissed skipper Andrew Strauss and Alastair Cook in the very first session of play in overcast conditions. However, a hamstring injury soon after, stole the fizz thereafter. “India lost the England series because Zaheer missed the remainder of the Tests,” Prabhakar said, before continuing: “But you cannot afford to rely on one bowler all the time. Zaheer has been winning matches for India on his own for some time now, but he needs support,” added Prabhakar, who played 39 Tests for India and has 96 wickets to his name. Zaheer played a stellar role in India’s rise to the No. 1 spot in the Test rankings. The Mumbai pacer almost single-handedly led India to a series win in England in 2007 where his 18 wickets saw him finish as the highest wicket-taker. He took 4-59 and 5-75 in the only win of the series at Trent Bridge. Then again, India would have struggled to register their second Test series win in New Zealand in 2008-09 had it not been for Zaheer’s brilliance in Hamilton. His invaluable contribution – three vital top-order Kiwi wickets. Zaheer was again the wrecker-in-chief as India whitewashed Australia 2-0 in 2010. His eight-wicket haul put Ricky Ponting’s men on the mat at Mohali. Once again, he finished the series at the highest wicket-taker (12). Then, his whirlwind performance – 3/54, 2/90, 3/62, 7/87 – saw India humiliate Bangladesh in their own backyard in 2009-10. Zaheer again rose to the occasion when India’s No. 1 position was under threat by the South Africans nine months ago. He took six for 93 to help his side win the Kingsmead Test by 87 runs to draw the series 1-1. Prabhakar said India will struggle to win without Zaheer. “Without Zaheer India are finished. India will struggle now considering Zaheer is not fit anymore. If you play with injuries, this is what will happen,” he said. Zaheer’s National Cricket Club coach Sudhir Naik said the pacer should set get his priorities right given his injury problems. “I suggest he only concentrates on Test cricket, play very few ODIs and avoid T20s completely. India badly need his services in Tests. Our bowling looked toothless without him. When Zaheer’s around, he doesn’t just bowl but also guides the younger bowlers. And they clearly looked helpless in his absence. This is not a good sign for Indian cricket. 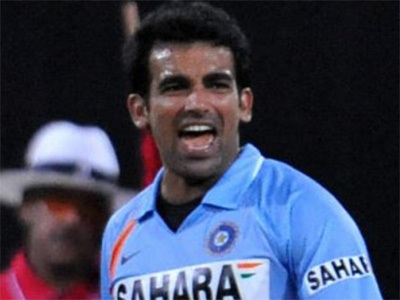 Zaheer is not going to be there forever,” said Naik, a former Test cricketer and current curator of the Wankhede Stadium.